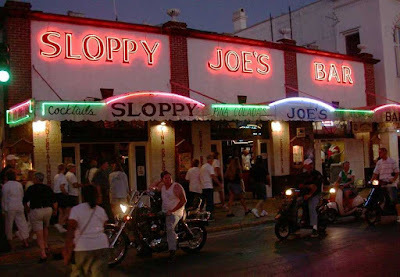 According to a police report a fight broke out between two couples when someone broke wind inside Sloppy Joe's in Key West, Florida. "The argument was due to someone farting," police were told by a man who was taken to the hospital for a dislocated shoulder after the alterction. Richard McBride, 53, and his girlfriend Sandra Stoner, 55, both of Naples, said they were caught up in a physical altercation after the argument arose “over a fart,” Officer Igor Kasyanenko wrote after last Monday’s incident. The couple said they were drinking with friends at the bar when Stoner traded words with an unidentified woman before getting out of her seat and confronting her in “an aggressive manner,” police said. An unidentified man tried to pull the woman away as others began to step into the dispute, including McBride, who pushed the man, police said. The man retaliated by striking McBride in the face and McBride responded by tackling, Stoner told police. The unidentified couple took off and police said they couldn't find them. Later at Lower Keys Medical Center, McBride said he didn't want to pursue charges and signed a release form.